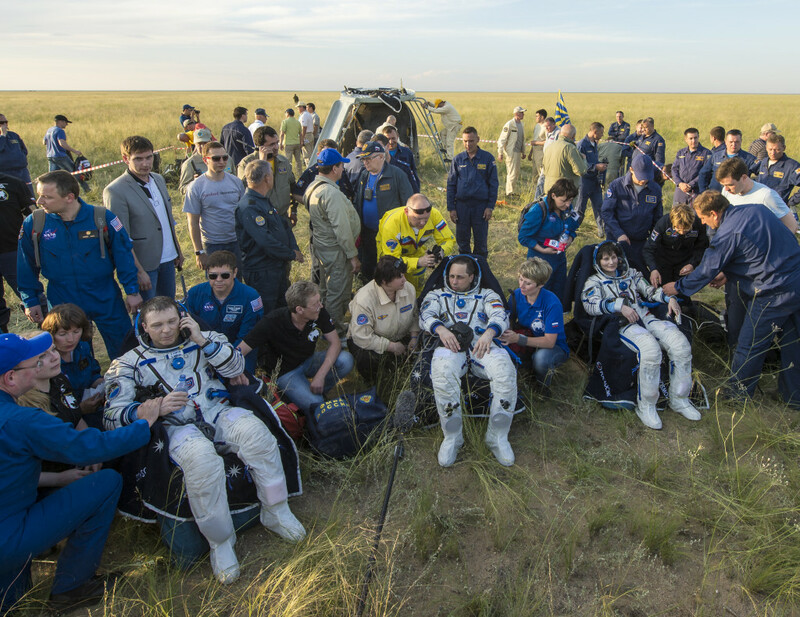 June 11, 2015 – Expedition 43 Commander Terry Virts of NASA, Samantha Cristoforetti of ESA and Anton Shkaplerov of Roscosmos landed their Soyuz TMA-15M spacecraft in Kazakhstan at 7:44 a.m. MDT. Russian recovery teams helped the crew exit the Soyuz vehicle and adjust to gravity after their stay in space. The trio arrived at the International Space Station on November 24, 2014, and spent more than six months conducting research and technology demonstrations. Virts, Cristoforetti and Shkaplerov spent 199 days aboard the space station and clocked almost 84 million miles during their time in space. The exposure to radiation increases as the duration of a mission increases. Astronauts encounter radiation composed of energetic cosmic rays that no current spacecraft or spacesuit can shield. To help understand the health effects of space radiation, and to determine how to mitigate risks for astronauts on extended missions, NASA recently announced three new NASA Specialized Centers of Research (NSCOR). One of these NSCOR teams will be led by Dr. Michael Weil, a professor of cancer genetics at Colorado State University. Weil and his colleagues have conducted radiation research funded by NASA for more than a decade. Samples from the ongoing Study of the Impact of Long-Term Space Travel on the Astronauts’ Microbiome investigation also returned on the Soyuz. The Microbiome study looks at the impact of space travel on the immune system and on human microbiomes – microbes living in and on the human body at any given time. Samples from crew members’ bodies and the space station environment are taken periodically to monitor changes in the immune system and microbiomes. The results of this study may add to research on health impacts to people who live and work in extreme environments on Earth, and help with research on early disease detection, metabolic function and immune system deficiency.